Hi Friends: There is a new challenge today over at the Crafting When We Can Challenges Blog, where the current theme is Christmas Come Early. Please visit our fabulous sponsor this week, Lacy Sunshine Stamps, to see all of their wonderful products! I printed the image onto PRISM Smooth White cardstock and colored her with my Spectrum Noir markers. I added some of the clear Spectrum Noir Sparkle pen to her dress and wings. I wanted to keep this card pretty simple, so I added a green embossed foil paper to my A7 card base, bordered with gold DCWV foiled paper. I cut my sentiment from the gold foil paper using the Spellbinders Holiday Sentiments die, then used the Grand Scalloped Ovals dies to cut the focal image and the gold layer beneath her. 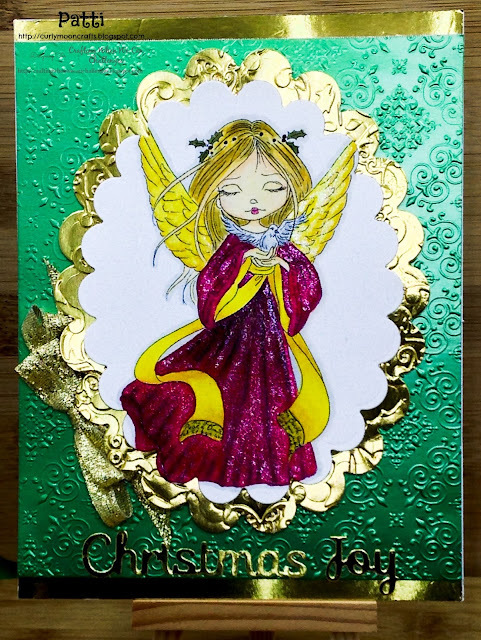 The gold scalloped layer was embossed with an Anna Griffin embossing folder, then the focal image was glued to it and added it to the base layer using foam dots. I added the sentiment to the bottom of the card, then finished it off with a gold bow. The colors are a bit more true Christmas green and red than the picture - it's been pretty gloomy and rainy here, so the photo colors aren't as true as they could be. Anna Griffin Christmas Holly Damask embossing folder.